We’ve got another exciting week coming up, with beer festivals, anniversaries, tap takeovers, Valentine’s events, and more! Nanaimo Craft Beer Week kicks off tonight with IPA Flight Night at Windward pub, featuring four top BC IPAs rarely seen on tap in Nanaimo. This is followed by a cask night on Friday at White Sails, featuring one-offs from White Sails, Townsite, and Gladstone. While the main festival on Sunday might be sold out now, there’s also a tap takeover at The Cambie on Saturday, featuring 12 beers from BC’s top breweries that have never been on tap in Nanaimo. On Friday night Major League 2 Taphouse in Chilliwack will be hosting an Old Yale Brewing Tap Takeover, featuring 10 of their beers and a special one-off cask. 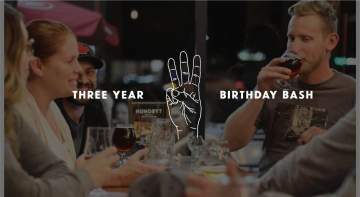 On Saturday, Trading Post Brewing is celebrating their third anniversary with a special beer release, live music, commemorative glasses, and brewery tours. If you can’t make it out to the brewery, they will also be hosting a release party and mini tap takeover at Darby’s Gastown that same day. If you are looking to plan something special for Valentine’s Day next Thursday, Luppolo Brewing is holding a beer and chocolate night with a guided pairing of 5 beers and chocolates lead by head brewer Ryan Parfitt and chocolate expert Jasmine Lukuku. That same night, The Drake is showing some love to the 6 breweries that supported them greatly during their early days, with all taps dedicated to Dageraad, Four Winds, Steel & Oak, Moody Ales, Powell, and Brassneck.